Statue of Liberty, originally uploaded by cheikhyass. 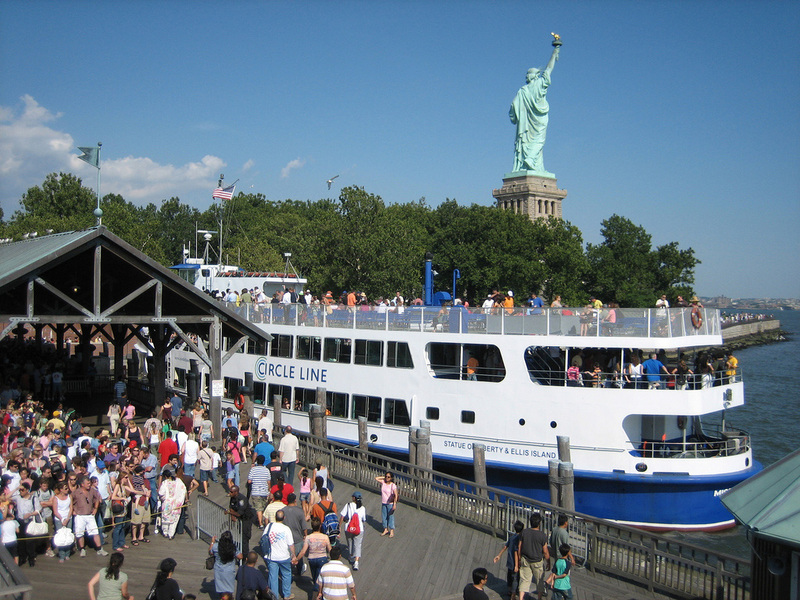 Statue of Libery and Ellis Island Circle Line Ferry, originally uploaded by Oquendo. 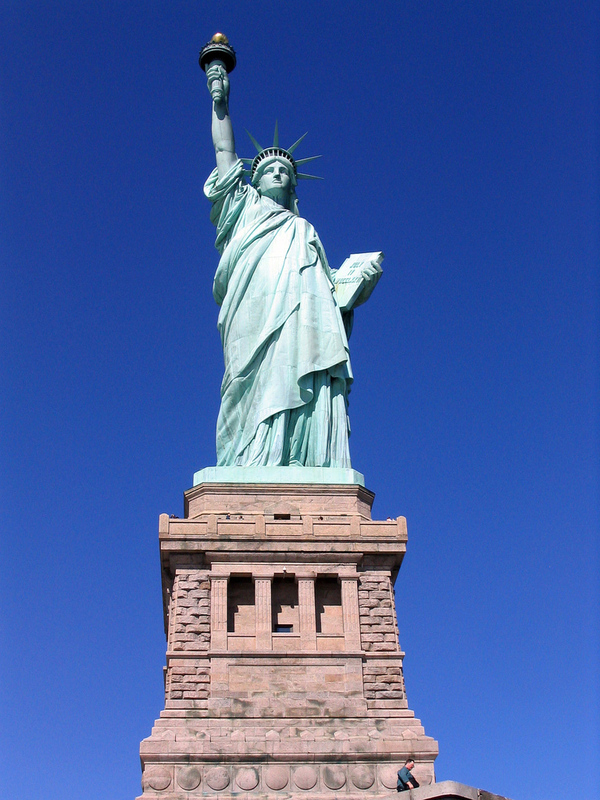 Statue of Liberty was included as a World Heritage Site on the basis of Cultural Criteria I and VI in 1984. Criterion I. This colossal statue is a masterpiece of the human spirit. The collaboration between the sculptor Bartholdi and the engineer Eiffel resulted in the production of a technological wonder that brings together art and engineering in a new and powerful way. Criterion VI. The symbolic value of the Statue of Liberty lies in two basic factors. It was presented by France with the intention of affirming the historical alliance between the two nations. It was financed by international subscription in recognition of the establishment of the principles of freedom and democracy by the U.S. Declaration of Independence, which the Statue holds in her left hand. The Statue also soon became and has endured as a symbol of the migration of people from many countries into the United States in the late 19th and the early 20th centuries. She endures as a highly potent symbol – inspiring contemplation, debate and protest – of ideals such as liberty, peace, human rights, abolition of slavery, democracy and opportunity. Aerial view of Statue of Liberty with Ellis Island in the background, originally uploaded by PixelFixer. Brief Historical Context surrounding Statue of Liberty. During the second half of the 19th century, the population of the United States of America nearly doubled in thirty years, from 38,500,000 inhabitants in 1870 to 76,000,000 in 1900. This prodigious growth is principally due to immigration, which reached, at that time, an unprecedented high. 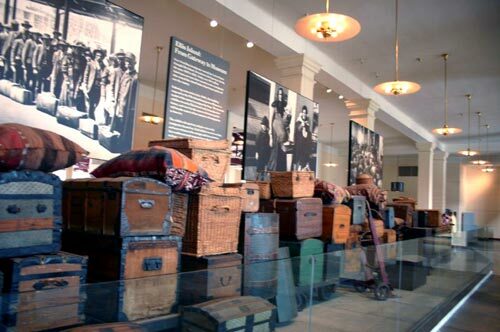 Between 1840 and 1880, 9,438,000 foreigners landed in the United States, among which, besides the British, were 31% Germans, 19% Irish and 10% Scandinavian. Between 1880 and 1914, the number of immigrants reached 22,000,000, this time deriving mainly from southern and eastern Europe. Ellis Island Museum - Immigrant's Luggage, originally uploaded by jeffpearce. 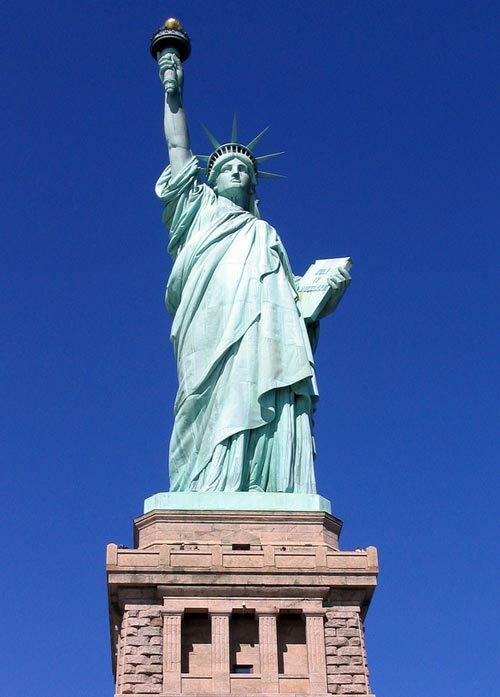 It is within the context of the immigration information above that the order for the Statue of Liberty was given to the French sculptor, Frederic Auguste Bartholdi. The statue, 151 feet (46 meters) in height, was officially inaugurated in 1886 on Liberty Island, a small island situated at the entrance to New York harbour one kilometer from the landing point of the immigrants, for whom it symbolized the ideals of Washington and Lincoln. Older Statue of Liberty Torch , originally uploaded by Eddy~S. Frederic-Auguste Bartholdi - sculptor of Statue of Liberty - NPS Photo. An older version of the Statue of Liberty Torch is located in the pedistal now. 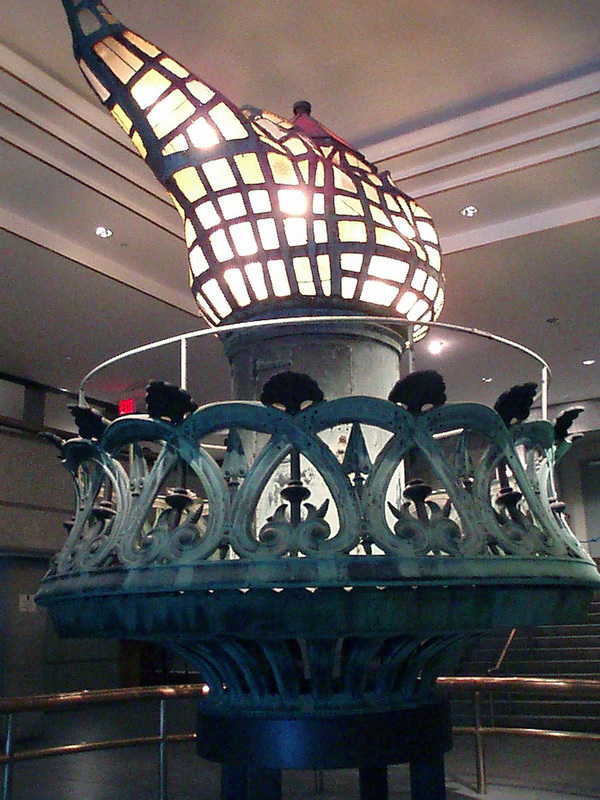 The torch was the first item of the statue to be constructed in 1876. The Statue of Liberty Torch was removed in 1984 due to corrosion, the original torch was modified many times, including the addition of over 200 panes of glass in 1916 by Gutzon Borglum, who also created Mount Rushmore in South Dakota. The addition of the panes of glass leaked water continuously inside the Statue causing corrosion damage. Statue of Liberty - Internal Structure Originally uploaded by Eddie~S. Alexandre Gustave Eiffel created the ingenious load-bearing metal framework on which the copper sheets of the statue were mounted. Eiffel would undertake the construction of the Eiffel Tower shortly after the completion of his work on the Statue of Liberty. 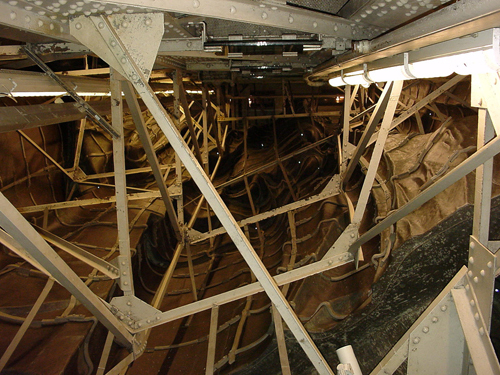 Eiffel's framework includes several of the most sophisticated features of the Statue. The general character of his work has been described as of "extraordinary daring, elegance, and refinement" and bearing a "seemingly weightless equipoise," when compared to other structures of the era that rely on a "thick accumulation of elements" for stability. Eiffel relies on geometry to provide a minimal frame capable of bearing great weight, but also accommodating wind stress in an almost elastic manner. The frame, along with the ingenious manner in which the Statue's skin is attached by floating joints, permits a great resiliency and flexibility, against both wind stress and thermal expansion and contraction. This system, in which all the plates are supported by the central frame rather than resting on one another, is not only an early example of curtain-wall construction, but, because of the construction of the joints, is also "an uncanny prophecy" of stressed-skin construction in aeronautical engineering. Statue of Liberty Interior Framework, originally uploaded by ngotoh. 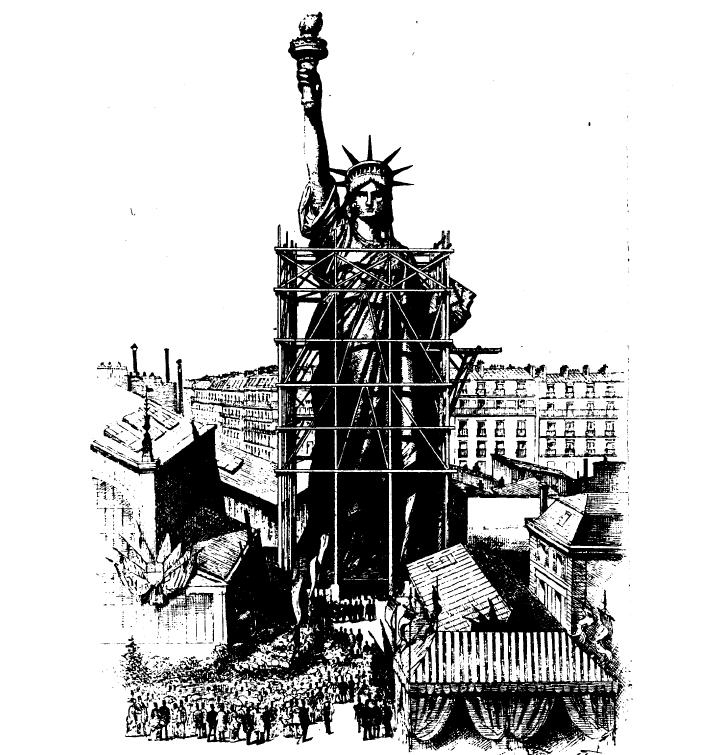 Statue of Liberty was first assembled in Paris in 1883 before it was disassembled and sent to the United States - Engraving from United States World Heritage Nomination Document. Laboulaye's views on America were formed in light of the history, to his day, of relations between France and the United States. Alliance with France had been vital, probably crucial, to American victory in the Revolution. This friendship was sealed in blood, for French soldiers lay buried on American battlefields. Although interrupted by the quasi-war of 1798-99 and several harsh diplomatic disagreements, the formal relations between the compatriot nations had ordinarily been reciprocally warm, and the personal relationships numerous and congenial. To illustrate the latter point, successive changes of regime in France had brought disparate groups of French exiles to the United States. A number of these individuals were illustrious: Chateaubriand, Talleyrand, Albert de Beaumetz, la Rochefoucauld-Liancourt, Comte de Ribbing, the future King Louis Philippe, Joseph Bonaparte, and Hyde de Neuville. Many of these figures eventually returned to France; others remained to enrich American culture. Laboulaye employed the good feeling prevailing toward the United States in France as a foil to indict the regime of Napoleon III. He contrasted the spirit and behavior of American leaders, such as Washington, with his Emperor's autocratic political methods. He used his pen to level his criticism in this manner, in such writings as Histoire des Etats-Unis, and he also lectured on the theme. Eventually, Napoleon forced him to stop lecturing on American subjects. Napoleon's fall, however, permitted Laboulaye to re-enter literary and political life. Laboulaye's convictions were to triumph in another way, for they were to be incarnated in sculptural form. Frederic Auguste Bartholdi, the sculptor of Laboulaye's ideal of Liberty, had trained in painting with the portrait artist Ary Scheffer, in sculpture with Jean-Francois Soitoux and Antoine Etex, and in architecture with Eugene Emmanuel Viollet-le-Duc. At 22, Bartholdi executed a twice-lifesize statue of Gen. Jean Rapp, erected in Colmar, the home of both the subject and the sculptor, in 1856. He had thus already shown a tendency toward work in large proportions when, that same year, he first traveled to Egypt. His tour there infused him with admiration for the grand sculptural scale on which the ancient Egyptians had worked, and unquestionably influenced the epic dimensions of his future projects. Bartholdi was in Laboulaye's circle of acquaintances. Laboulaye apparently first suggested a memorial to honor the birth of the American nation and the lasting friendship between France and America to the young sculptor in the summer of 1865, when French popular sentiment toward America had been deeply affected by the assassination of President Abraham Lincoln. Bartholdi did not at once embrace Laboulaye's idea. In 1867, on the contrary, he began an effort to persuade Khedive Ismail of Egypt to support construction of a colossal statue for erection at the northern entrance to the Suez Canal, a Franco-Egyptian project then nearing completion through the genius of Ferdinand de Lesseps. Bartholdi journeyed to the opening ceremonies of the canal, in 1869, to promote his project and other building plans in Egypt, but nothing came of his efforts. 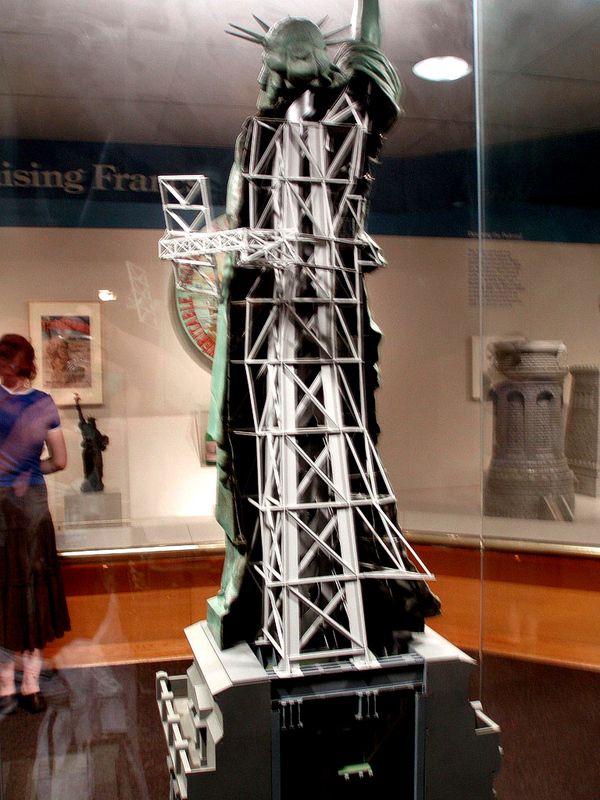 Bartholdi would later deny any direct connection between the proposed "Progress" or "Egypt Carrying the Light to Asia," and the Statue of Liberty, but the similarities of the two projects, as evidenced by the models Bartholdi prepared, are rather marked. Both featured colossal torch-bearing female deities placed at the entrances to key waterways, where they were intended to serve as lighthouses — and symbols. 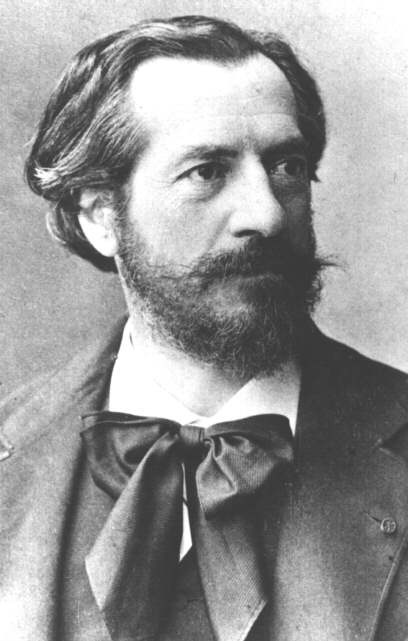 Bartholdi's papers give evidence that he began to contemplate a project for America in 1869. By the time the idea had formed sufficiently in his mind to inspire him to go to the United States, in 1871, France was suffering the calamitous aftermath of defeat in the Franco-Prussian War. This conflict touched Bartholdi in several ways. As a soldier, he played an ineffectual role in trying to prevent the seizure of his native Alsace by a resurgent Germany. Along with Lorraine, however, Alsace was torn from France and ceded to the new German Empire. Symbolic manifestations of France's humiliation, to the sculptor, as he pursued his own projects, were the approaching completion of Ernst von Bandel's 28-meter statue of "Arminius," in Westphalia, which bore blatant anti-French inscriptions, and the beginning of Johannes Schilling's "Germania," a 10-meter figure erected at Riidesheim, near the Rhine. Bartholdi indicates that when he arrived in New York Harbor, the plan for the Statue took clear form in his mind. In America, which he toured from coast to coast for 5 months, he was received by President Ulysses S. Grant, Senator Charles Sumner, Henry Wadsworth Longfellow, and many others, who offered him hospitality and encouragement. 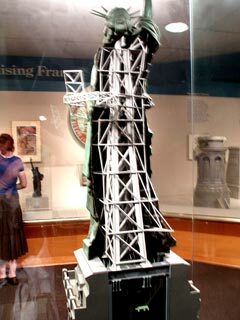 After his return to France, Bartholdi began work on a model. In the years 1871-75, he continued to refine the figure and executed other works. Public fundraising for the Statue in France did not begin in earnest until 1875. Some scholars have suggested that this long delay, which prevented completion of the project in time for the U.S. centennial, arose from the desire of Bartholdi's backers to await an opportune time for the public announcement of a project that had rather explicit political overtones. According to this theory, the Statue was not a proposal that the various factions of monarchists or the radical left could be expected to embrace readily. The political situation in France was, indeed, in flux in the years 1871-75, but equally important, the economic situation was also volatile, making the prospects of a public solicitation doubtful. The formation of the Franco-American Union in 1875, with Laboulaye as president, in any case, coincided with the definitive rise to power of moderate, or liberal, republicans, including Laboulaye and his circle, in the French Government. 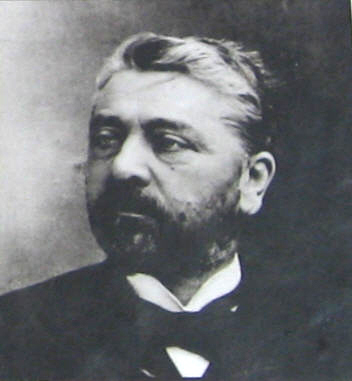 For example, a useful connection was established with the appointment of Bartholdi's cousin as the French Minister to the United States. The succeeding years, furthermore, witnessed an extraordinary renaissance of French economic, artistic, intellectual, and scientific vigor; the climate was suited to the accomplishment of the effort to erect the Statue. This monument will be executed In common by the two people, associated in this fraternal work, as they were formerly in founding Independence. We shall make a gift of the Statue to our friends of America; they will unite with us to provide the cost of the execution and of the erection of the monument which will serve as a pedestal. We will thus affirm, by an imperishable souvenir, the friendship which the blood shed by our fathers had sealed in days of yore between the two nations. Despite the economic, intellectual, and political prowess of her prime backers, Liberty was thus not to be financed by either the French central government or a small elite group. The first fundraising efforts of the French committee focused on municipalities, civic associations, and businesses. When these efforts did not yield sufficient funds to meet the costs of construction, a lottery and other devices, including concerts and the sale of models of the Statue, were utilized. 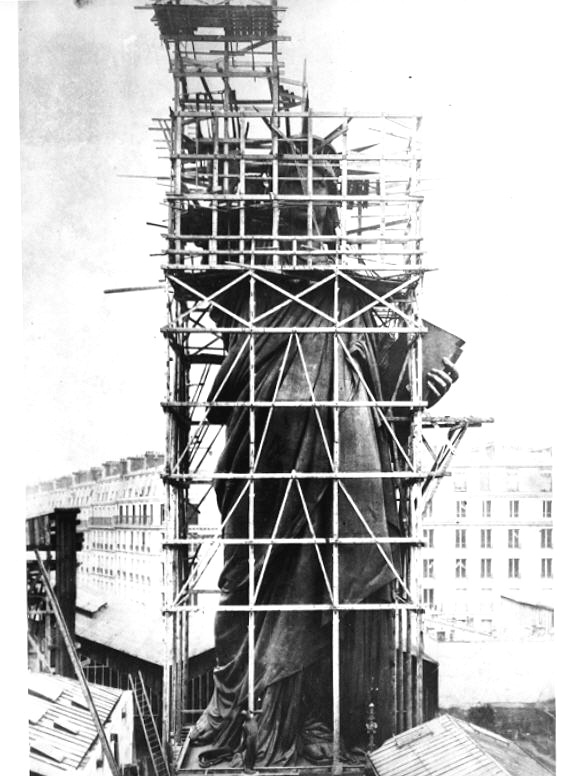 These efforts brought in contributions sufficient, by July 1880, to insure the completion of the project, on which Bartholdi and a corps of skilled workmen were already hard at work. More than 100,000 individuals subscribed, and 180 towns and municipalities. The total contributed was the equivalent of about $400,000. Bartholdi supervised construction, in the workshops of Gaget, Gauthier, et Companie at 25 Rue de Chazelles in Paris. The preliminaries to construction included choice of the material, which had to be light, easily worked, and able to resist the maritime climatic conditions to which the Statue would be exposed. Bronze was too heavy. Copper, relatively light and easily worked, was chosen. Another key decision was to utilize an interior skeleton of iron that would support the thin copper sheets of which the Statue's exterior would be composed. Such a "hollow" design would permit maximum ease of access to the interior of the head and the torch. To arrive at the final form of the Statue required a three-step enlargement process. Bartholdi had made various plaster study models of the figure. From one of these, which was 1.25 meters (4 feet) high, he prepared a 2.85-meter (9.3-foot) reproduction. From the latter, he enlarged to 11 meters (36 feet). This last version was next cut into sections, each of which was then reproduced four times its size in plaster. Statue of Liberty Wooden Molds, originally uploaded by Eddie~S. The preparation of each final section of the last model involved thousands of measurements. When each portion had been enlarged, carpenters prepared wooden molds around it. Copper sheets were then hand-hammered into the molds. 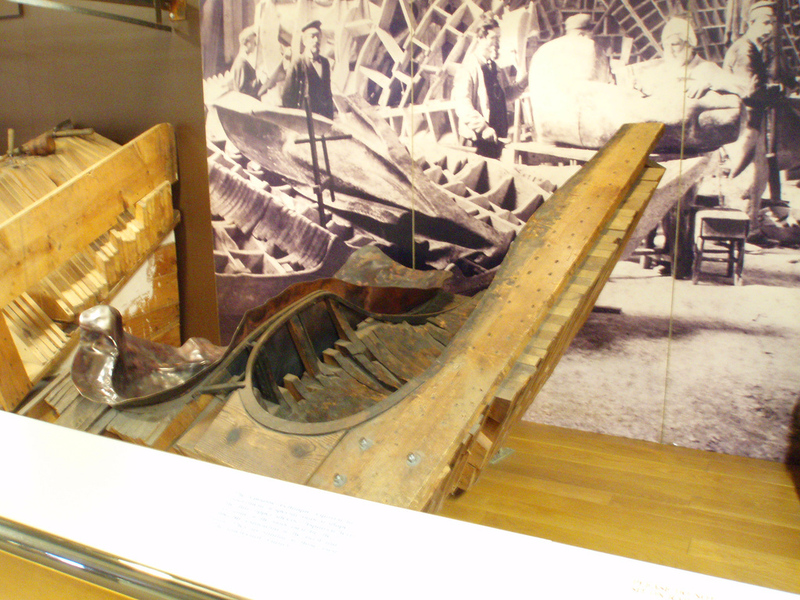 More than 300 large sheets of copper were required, and all were subjected to this process, known as repousse (a technique then in vogue for construction of the exterior walls of the upper floors of French buildings). As work proceeded, completed parts of the Statue were exhibited to spur public support for the project: the hand and torch in Philadelphia at the Centennial Exposition of 1876 and later in New York City, and the head at the Paris Exposition of 1878. Statue of Liberty was first completed in Paris between 1883 and 1884 before being disassembled and shipped to the United States. 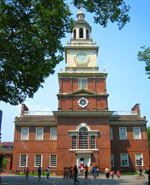 Photo from United States World Heritage Nomination Document. Statue of Liberty in Paris dedicated July 5, 1889, Eiffel Tower in background - originally uploaded by Fabrice Terrasson. 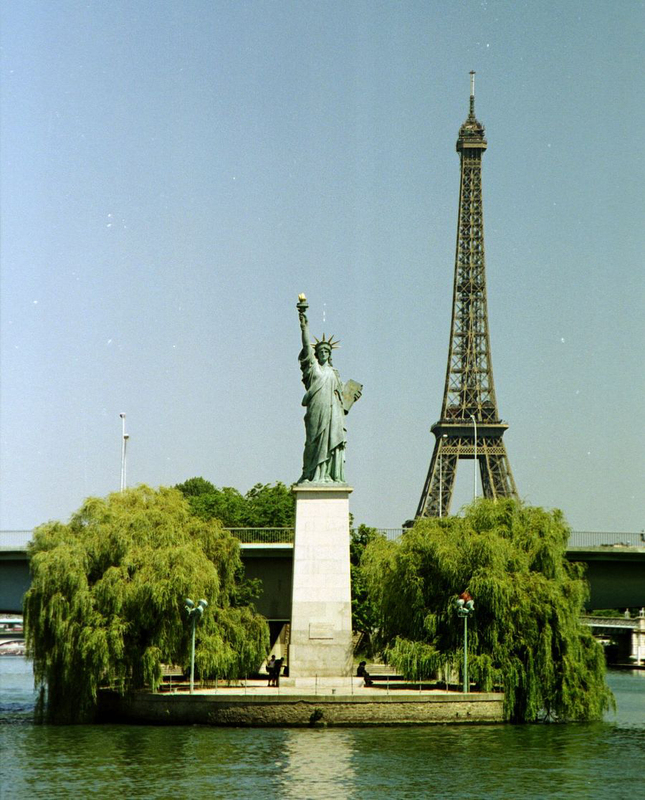 Bartholdi had received a favorable reaction to the idea of the Statue when he first visited the United States in 1871. In 1875, when the Franco-American Committee was founded, a few Americans endorsed the project. The following year, inspired by Bartholdi's second visit, on which he exhibited a schematic of the finished Statue of Liberty , and coincident with the display of the hand and torch in Philadelphia and New York, the American Committee was formed, principally to finance and arrange for the construction of the pedestal. The Committee's first effort was to convince Congress to accept the French gift, offer a suitable site, and provide for future maintenance. 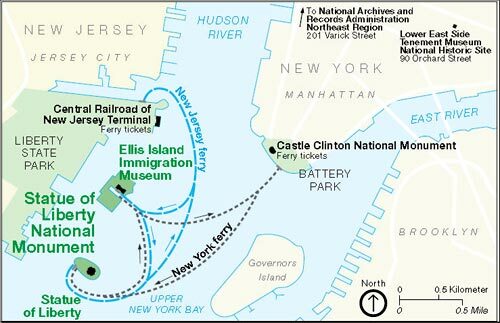 Authorizing legislation to these ends was passed in early 1877, and Fort Wood, a recently decommissioned military battery on Bedloe's Island, in upper New York Harbor, the site which Bartholdi preferred, was the location chosen. When Bartholdi announced, in July 1881, that the Statue would be completed in 1883, however, relatively little money had been raised for the pedestal. Among the factors that discouraged contributions were artistic and religious criticisms, dissatisfaction with the proposed location, a tendency in other parts of the Nation to view the project as a New York City affair, anti-Statue editorials in some leading newspapers (including several in The New York Times), and dissatisfaction with the thought of the United States paying for the pedestal. Plans for the pedestal, by architect Richard Morris Hunt, were available in late 1881. They indicated that 9 months would be required to erect it and that the cost would far exceed original estimates. The Committee continued its efforts with modest success and decided to begin work with the funds on hand. Ground was broken for the foundation in April 1883, and it was completed in May 1884. Adding to the financial burdens of the Committee were unexpected difficulties in excavating for the foundation within the walls of old Fort Wood, within which the Statue was to be erected, and design changes in the pedestal. Early in 1885, only preparatory work had been done on the pedestal itself. The Committee was $100,000 short of its goal, and had to halt construction. The Committee renewed its appeals, soliciting the public, the New York legislature, and the U.S. Congress, all to little immediate avail. The situation was embarrassing because the completed Statue had already been presented to the American Minister in Paris, and was being readied for shipment to New York. The individual who galvanized the public into raising the money required to complete the pedestal was Joseph Pulitzer, owner-editor of The (New York) World. In March 1885, Pulitzer renewed the newspaper crusade he had begun on behalf of the "pedestal fund" in 1883. He re-emphasized the national and egalitarian nature of the project, railed at the wealthy of New York for their lack of generosity, and appealed to the "working masses" to make up the deficiency in the fund.5 The participation of the French public was also held up as an example. Pulitzer's success had, meantime, in mid-May, permitted the Committee to resume work on the pedestal. At that point, only 8 of its projected 46 courses of masonry were in place. In June the Statue arrived, and provided an additional impetus to the fundraising drive. Pedestal construction proceeded quickly thereafter, and was completed in April 1886. The complicated task of reassembling the Statue consumed the summer and early fall of 1886. The Statue of Liberty was at last dedicated on October 28, 1886. President Grover Cleveland formally accepted the gift from the French. Bartholdi himself unveiled the face. Although an enormous crowd, including a number of French dignitaries, witnessed the ceremony, Edouard de Laboulaye was not present, for he had died in 1883, before the Statue had been fully erected in Paris. 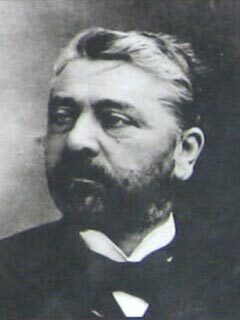 His successor as president of the Franco-American Committee, Ferdinand de Lesseps, the "builder" of the Suez Canal, made the presentation speech. De Lesseps, who had early been recruited to the cause by Laboulaye, was an unusually appropriate alternate for his predecessor. The Statue of Liberty has evolved, both physically and in terms of her symbolic meaning, since her placement on the pedestal in 1886. One conspicuous change is an alteration in physical appearance caused by the action of the elements on her formerly bright copper exterior, which soon acquired a light-green patina. Some physical alterations have been made deliberately. For example, a number of attempts have been made to improve her lighting. Bartholdi was not satisfied with the original system of electrical illumination (a science then in its infancy), which did not light her as brightly as he had envisioned, certainly not well enough to be of significant use to navigators. In fact, Bartholdi, for that reason, suggested gilding to improve her lighting. For symbolic, as well as practical, reasons, then, the original electrical system has been successively replaced by more modern generations of equipment, in 1916 (including the first reasonably effective floodlighting), and in 1931, and enhanced in 1945 and 1976. The 1916 changes were financed by a popular subscription conducted by Pulitzer's heirs at The World. The torch of the Statue was revamped in connection with the changes in 1916. Tinted cathedral glass was installed, by Gutzon Borglum, to provide more dramatic lighting effects. 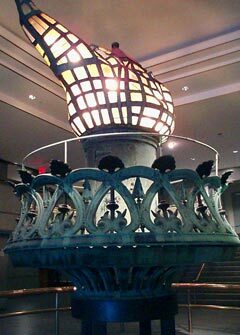 Although Liberty's "lamp" has been briefly extinguished altogether on several occasions since 1886, her lights have been conspicuously "turned off" for only one prolonged period, during World War II. This was done partly as a civil defense measure, but its symbolic significance did not go unnoticed. Under varying forms of administration, the Statue has remained a popular object of visitation. Although she did not serve effectively as a lighthouse in practice, she remained under the administration of the Lighthouse Board of the U.S. Treasury Department until 1901. From 1901 until 1933, she was under War Department jurisdiction, although in 1924, she (and her immediate site) were declared a National Monument, by order of President Calvin Coolidge. Along with a number of other historic properties, the Statue of Liberty National Monument was added to the National Park System in 1933. The Army, however, retained control over the remainder of the Island until 1937. The Statue's symbolic character has evolved and expanded in the past century. She has become one of the premier symbols of the United States, as well as remaining an enduring expression of the friendship between France and the United States. 1 The basic outlines of this historical treatment of the Statue are adapted and condensed from Benjamin Levine and Isabelle F. Story, Statue of Liberty (Washington, D.C.: National Park Service, 1952, 1957). Other material, especially that found in Oscar Handlin, Statue of Liberty (New York: Newsweek, 1971), has also been useful. 2 J. Fred Roush, "Edouard Laboulaye, The Father of the Statue of Liberty,' (National Park Service, no date). This letter to George Bancroft (in facsimile and translation) appears in an unpaginated section of the report. 3 Cited in Marvin Trachtenberg, The Statue of Liberty (New York: Penguin Books, 1977), p. 31. 4. Notice sur L'Union Franco-Ameriyaine Inauguration De L'Exposition Des Lots de La Loterie Franco-Ameriqaine, Discours De MM. Bozerian et Henri Martin, senateurs, cited by Regina Maria Hughes, "The French People Give the Statue of Liberty to the Americans, pp. 10-13, in Ray J. Kelley et al., "History of the Statue of Liberty" (New York: National Park Service, 1934). 5 Text in both French and English. The (New York) World, June 20, 1885, p. 4. 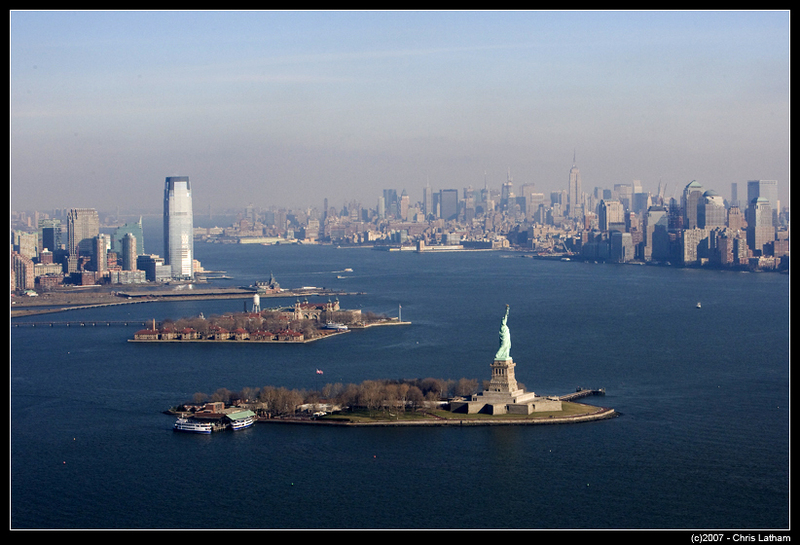 The Statue of Liberty is located on Liberty Island in the lower New York Harbor, about 1 mile from Lower Manhattan. The Statue of Liberty is accessible by ferry service only. This is an aerial view of the Statue of Liberty on Liberty Island in the lower New York Harbor. The location marker is pointing to the Statue of Liberty.